A very dark, yet extremely, funny spin-off of Forgetting Sarah Marshall. Made for fans of the Aldous Snow character from Forgetting Sarah Marshall and intelligent, dark indie comedies with a little bit of heart. Rated R for strong sexual content and drug use throughout, and pervasive language. Forgetting Sarah Marshall is easily the best Apatow production. And being a spin-off with Sarah Marshall’s side character Aldous Snow (Russell Brand), you would expect Get Him To The Greek to be a similar sequel – but it is not. While Get Him To The Greek at first comes across as having the same sense of humor as Sarah Marshall, if you pay attention closely during the intro you will notice that there is a hint of dark, serious subject matter – which tone later brilliantly takes the film to a place you never thought a Sarah Marshall spin-off would end up taking you. Forgetting Sarah Marshall was written by its male lead, Jason Segel (I Love You, Man and TV’s How I Met Your Mother). Segel did not write Greek; however, he did co-produce the film along side Judd Apatow, even writing a few original songs for Snow’s fictional band Infant Sorrow. Sarah Marshall fans, fear not. You need not worry. Sarah Marshall director Nicholas Stoller both wrote and directed Greek – not mimicking Segel’s awesome screenplay, but making his own original piece of work with Segel’s memorable characters. Now, to put an end to the confusion. 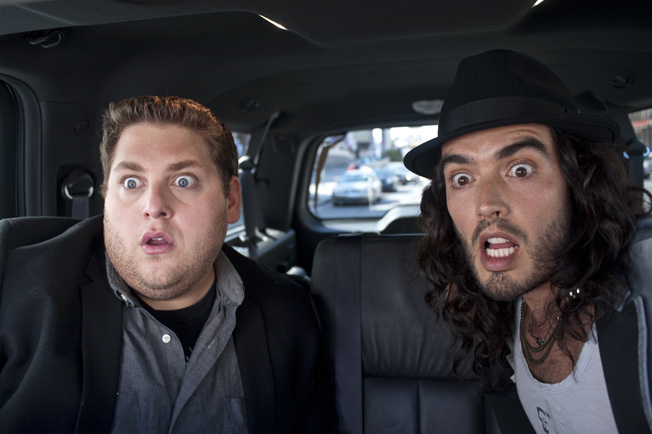 Yes, Russell Brand plays the same Aldous Snow character from Forgetting Sarah Marshall. No, Jonah Hill does not play the same Snow-obsessed waiter from Forgetting Sarah Marshall. Get Him To The Greek takes place nearly a decade after we saw Aldous Snow on a Hawaiian getaway in Forgetting Sarah Marshall. Since then, Snow has gone through a lot of changes. After dating Sarah Marshall, he remained sober in a 7-year relationship with a Lady Gaga-esque pop star named Jackie Q. (Rose Byrne, Knowing and TV’s Damages). When the two broke up, Snow fell off the wagon and put out a flop album that drove his career into the pavement. After that, he disappeared from the music industry. Hill plays Aaron Green, a record label manager and die-hard Infant Sorrow fan who pitches the idea to his boss Sergio (Sean ‘P. Diddy’ Combs) to put on an Infant Sorrow concert to commemorate the tenth anniversary of their Live At The Greek concert that is one of the highest selling albums of all time. After taking to the idea, Sergio sends Aaron on a nearly impossible 72-hour mission to pick up Snow in London, take him to the Today Show in New York to announce his anniversary concert and get him to the Greek Theater in Los Angeles for the show. Although the first third of Greek is filled with typical R-rated comedy, the atypical Aldous Snow character keeps it original and funny – separating it from the norm. The second act adds the heart and soul that Forgetting Sarah Marshall possessed. It delves into relationships, heartache and love. And the third act is all over the place. It gets extremely dark and grim. But while you may not be expecting it, it has a purpose. Dark and grim is the lifestyle of a rockstar. The third act will not work for everyone, but there is no denying that it accomplishes what it sets out to do. It broke away from anything you would expect and anything you had seen before. It dared to do something different. It was a bold move that I hope you will analyze. If so, you will appreciate it. But if you do not treat this like a dark, indie comedy, then you most likely will not care for the final act. Just as the film takes a serious tone, so do the characters – and the actors rise to the occasion. Hats off to Russell Brand for showing us that he is more than a one-trick-British-pop-star-pony. His performance in the third act is one of the finest of the year. The tone shifts between the three acts works well because they each serve their purpose. But if there is one main flaw with Greek’s storytelling, it is in the subplots. It feels like it knows where it wants to go, but doesn’t have the perfect path plotted out to get there. Thrown in throughout the film are little gags that require a lot of set-up for a few laughs. Their purpose – other than to do the outrageous – is not essential to the main story. For most films, these are the scenes that would end up in an uncut and unrated version. But even though they show up in the theatrical cut here, I am sure there will be many more when Greek hits home video. If only every great side character had the opportunity to be so well fleshed-out like Brand has done with Aldous Snow! If you fell in love with the characters from Forgetting Sarah Marshall, then there is no reason why you shouldn’t join them on another funny and emotionally charged journey. Note: Be sure to stay to the end of the credits for a fun five-second extra.